"I use to be a bear and a good old bear to..." So sitting around with my patrol we where trying to think of how to leave our mark on the service patrol emblem. I saw an unusual stick on the ground, picked it up and started to carve. In no time flat there was a Bear tooth (colored with permanent marker) hanging from the shovel. (Setting the bar high on the first day.) 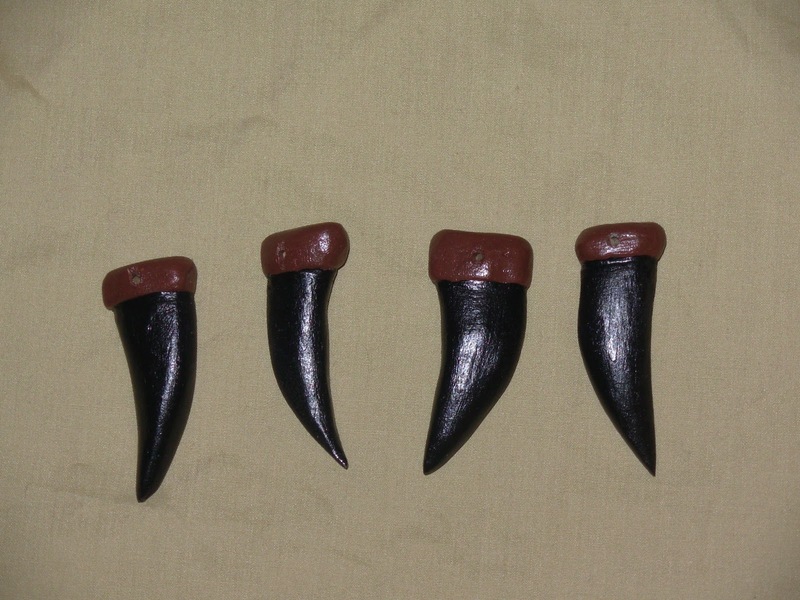 I took the same stick home and carved four more teeth for our patrol flag. What you don't see (because I have that side down) is each bear tooth has our name painted on it. I still am not sure what kind of wood it was but they should look great hanging from our flag! The second project will don the program patrol emblem and is based on our totem drawn on the first day we were a patrol, Made from maple, it was a piece I messed up on with the Monkey slide but worked well for this slide. 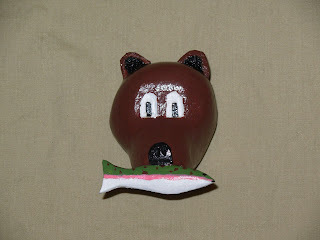 The ears are made of leather and the fish was carved separately and glued on. Painted with craft paints and sealed with a few coats of poly. and now its "Back to Gilwell, happy land, I'm going to work my ticket when I can"
EDIT: I'm pleased to say, the bear totem slide is now on it's way to N2-66-11-1 August 26-28th 2011 at Camp Tadma. Good luck with the course Mark and thanks for bringing the spirit of the Bear Patrol and NE-II-192 with you.